With the hustle and bustle of day to day commercial activities at The Fort, who would believe that just over a decade ago the only place where you can buy anything of interest here was the army commissary? Yes, after a hectic pace of planning and construction, this former military reservation, previous home of the Armed Forces of the Philippines, has now transformed itself into a commercial and residential hub at par with the best in the country! 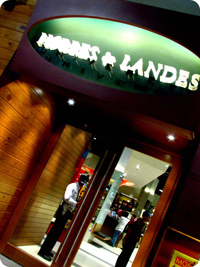 Shopping in Fort Bonifacio has also been given the 21st century makeover in Market! Market!, the plush and ecclectic mall concept that integrates otherwise separate shopping components into one. Loosely patterned on the hawker center of Singapore, Market! Market! has grouped individual retailers of toys and gifts, as well as housewares, furnitures, and even market produce into special geographic one-stop sections so that the buyers will have the benefit of finding and comparing similar or purpose-built items. This makes the buying process easier and more fun. If you suddenly find yourself empty-handed two hours before a children’s party, Market! Market! is the must-visit shopping mall to go to! Imagine section upon section of some of the more popular toys for you to compare and choose from! You can get some of the latest action figures, as well as electronic games and what nots by simply popping in to any stall within the toys and gifts section. Dolls and stuffed toys are also plentiful as you enjoy the benefit of choice offered by the store owners who bring in such a diverse range of items. If housewares and furnitures are two words that cause you to automatically reach for your checkbook, then Market! Market! offers a selection that may just possibly max out your disposable income! Imagine looking at row upon row of some of the finest hand crafted products proudly made by Philippine craftsmen, or imported from some of the more exotic locations throughout Asia. The finest silk fabrics from Thailand on such mundane everyday items like throw pillows. Hand carved Kamagong for the everyday soup ladle or serving spoon for rice? And these are just for starters. Pick up a pair of hardwood chopsticks before you even go past your fifth booth. Then find some beautiful bookends that will complement the mother-of-pearl inlaid baul you will pick up before the hour ends. Such extraordinary finds are seemingly commonplace here. 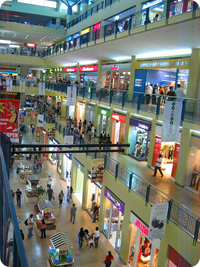 Each pasillo or corridor opening into potential finds and personal treasures for each shopper. And then you move towards one end of the mall, following the faint scent of newly ripe fruit. Here you will find export quality mangos, avocados, lanzones, and some other fruits of the season, as well as exotica such as Durian, Marang and Mangosteen. Although seasonal, the fruits at Market! Market! are as fresh and as sweet as if they were just plucked out of a tree just earlier in the day. A few feet back from the fruit section is a host of shops selling fresh flowers. Aside from the usual roses, these stores have the occasional bunch of cala lilly, sought after by those getting married, and tulips, sought after by those wanting to propose with flair. And if at the end of the day you opt for something less fancy to place at the center of the daily dining table, then a broad selection of carnations, gerberas and Malaysian mums might be more to your liking. Whatever your taste, for whatever reason, Market! Market! has something for you.